This sort can be used as an assessment, individual work, or even center work. Students take ten shapes and sort them in a foldable. A foldable with pictures and descriptions of 12 polygons. This foldable can be used with interactive notebooks, as a study guide, or can even be cut up and used as a matching game. 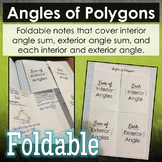 This foldable can be used in math interactive notebooks or as a hands-on activity to help remember the types of polygons. Each flap has a polygon name and shape example. Have students write a definition, draw more examples, or any creative additions you have to add. This foldable shows students how to find the area of regular polygons and provides example problems. Cut down the dotted line in the middle of the page. Place one side on top of the other staggering the titles and you will create a flip book. Please let me know if you need assistance. A foldable is great way to review! This interactive foldable is a fun way for students to remember characteristics of a polygon such as whether or not a polygon has a similar or congruent shape. Have students fill in this foldable with you to keep their area formulas organized. You can add as much detail as you would like! Foldable notes for chapter on Area of rectangle, parallelagram, triangle, trapezoid, rhombus, kite and regular polygons. Also provides space for polygon ratios, circles, sector, arc, and circle segments. Three foldables for teaching lines, line segments, polygons and quadrilaterals. Students can put these in a math notebook and use as a ready reference or as a review tool. Students will create a foldable to learn about the different attributes of the different polygons. 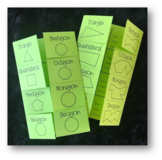 Then students will go on a scavenger hunt to search for these shapes around the classroom. 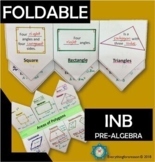 A simple foldable with sections to include information on the area of a parallelogram, triangle, trapezoid, and composite figure. I would put the formula on one side of the inside, and then an example on the other. Use it however you like, though! 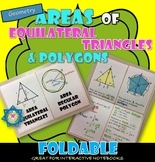 Teach students the properties of similar polygons including scale factors, congruent angles, and proportional sides with this comprehensive and detailed foldable. Answer key is a free product on my PTP page.